FDA: Diabetes Drug Avandia Increases Heart Attack Risk : Shots - Health News An internal agency battle comes to light as FDA scientists say the popular diabetes drug is too risky to remain on the market. 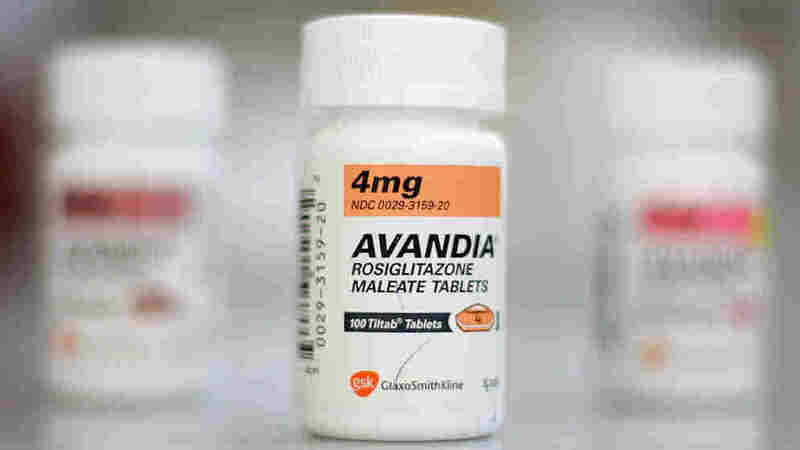 GlaxoSmithKline's controversial diabetes drug Avandia -- the most popular diabetes drug in the world -- increases the risk of heart attacks, strokes and death. That's the conclusion found repeatedly in 765 pages of documents the FDA released today. The documents were released in advance of an unprecedented 2-day advisory panel meeting set for next week that will likely determine whether the agency pulls the blockbuster drug off the market. The panel meeting will also make public an internal battle brewing at the agency, as some FDA scientists have been calling on the agency to pull the plug on the drug for years. Dr. David Graham and Dr. Kate Gelperin of the FDA say that continuing a study of Avandia versus another diabetes drug, Actos, would be "unethical and exploitative." Pretty strong words from inside FDA. Graham's claim to fame, you may recall, is as a whistleblower on several drug approvals gone sour, including the painkiller Vioxx. Avandia's maker, GlaxoSmithKline, has its own studies and disagrees with Graham's conclusions. Expect big fireworks next week at what's normally a tame advisory panel hearing. Avandia used to be a multibillion-dollar-a-year drug. Since it's safety came under attack, sales have slumped. In the first quarter of this year, world-wide sales of Avandia were about $245 million, down 10 percent from a year earlier, according to the Wall Street Journal. In case you need a refresher on how this whole Avandia thing got started, we've developed this handy timeline. 1999: The FDA approves Avandia for controlling blood sugar in people with diabetes. Fall 2006: The Lancet publishes a study showing Avandia can prevent diabetes in people at high risk. Cardiologist Steven Nissen of the Cleveland Clinic notices that the study also showed an excess rate of heart attacks, strokes, and death from cardiovascular disease, and begins studying the drug. May 2007: The New England Journal of Medicine publishes an analysis by Nissen of 42 studies of Avandia. His conclusion: The drug increases the risk of heart attacks by 43 percent. The FDA releases a safety alert on Avandia. June 2007: NEJM publishes a study by manufacturer GlaxoSmithKline showing Avandia does not cause heart problems. The House of Representatives meets to consider whether the FDA should continue to allow Avandia to be sold. July 2007: An FDA advisory committee concludes that there’s definitely an increased risk of heart disease, but the drug should be left on the market because it’s so effective at controlling blood sugar. November 2007: At the request of the FDA, the manufacturer puts a “black box” warning on Avandia. February 2010: Congress weighs in again: The Senate Finance Committee accuses the manufacturer of holding back data that shows problems with Avandia. May 2010: Studies in the Journal of the American Medical Assocation and the Archives of Internal Medicine show that Avandia increases the risk of cardiovascular problems. The JAMA study comes from the FDA, and includes data from 227,000 patients. The lead researcher concludes that for every 60 people on the drug for a year, there’s an extra heart attack, stroke, heart failure or death. July 13 and 14, 2010: The FDA convenes another advisory committee meeting to vote on whether to take Avandia off the market. 2015: The manufacturer is expected to release results of a large trial designed to answer the question of whether Avandia causes heart problems. Some people want this trial called off, saying the drug is dangerous.